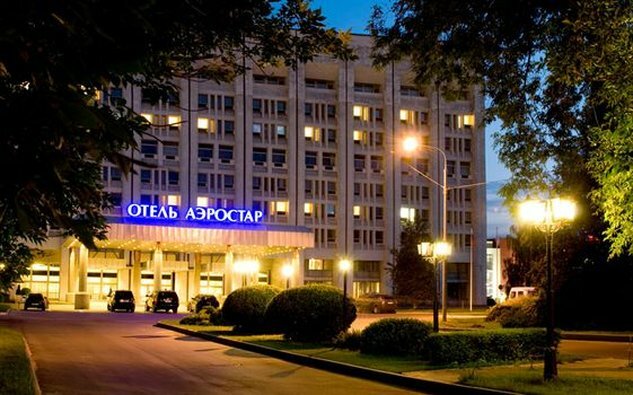 The 9-storey business hotel is located on Leningradsky Prospekt, a 10-minute walk from Dinamo Metro Station and Petrovsky Park, a 10-15 minute drive from Belorussky Train Station (2.7 km) and the Kremlin (6 km). The Moscow-City business center, the Expocenter and the World Trade Center can be reached in 15 minutes, the Sheremetyevo Airport and the Crocus Expo exhibition center in 30-40 minutes. From the hotel you can walk to the Ice Palace of Sports at Khodynsky Field, CSKA Sports Complex, Dynamo Stadium, the Dynamo Metro Station and Petrovsky Park. From the windows of the hotel, on one side, there is a view of an architectural monument of the 18th century - the Petrovsky Palace, and on the other side of the modern architectural complex Moscow City. Hotel Aerostar offers 302 rooms of different categories. There is a room for people with disabilities. Each room has a safe, hairdryer, bathrobe and slippers, complimentary toiletries, wake-up service, pillow menu service, telephone, flat-screen TV, air conditioning system with individual settings for thermal conditions. All rooms are equipped with tea stations, each floor has coolers with drinking water. The Estrada Lobby Bar is located on the second floor, right above the lobby, and is open around the clock. The bar offers drinks, meals and snacks, pastries. The main restaurant of the hotel "Brasserie Erte" is named after the Russian artist Roman Tyrtov, known throughout the world under the pseudonym ErTe. The design of the hall used elements of Art Nouveau and Art Deco. The restaurant is located on the fourth floor of the hotel. The restaurant can hold weddings and banquets. The hotel "Aerostar" has 17 conference rooms and meeting rooms with capacity from 15 to 450 people. All rooms have individual or central air conditioning, access to wired and wireless Internet, direct telephone lines in Moscow. Event participants are offered a wide choice of business lunch and coffee break menus, as well as business center services (computers, Internet access, e-mail, fax, printer, bookbinding, lamination, secretarial services). There is the possibility of a gala dinner, including the organization of music and entertainment programs. Other services and facilities of the Aerostar Hotel include: a fitness center with gym and sauna, concierge services (taxi, car rental, air and train tickets), laundry and dry cleaning services, an ATM. For the convenience of guests, transfers to the largest exhibitions in Moscow, which are held at the Expocentre and Crocus Expo, are organized. Buses depart from the main entrance to the hotel.